Izusen serves delicious and delightfully presented full-course vegetarian meals with an emphasis on tofu in beautiful red lacquer bowls. This is known as shojin ryori, or food fit for devotees in religious training, and refers to the Buddhist strictures against eating meat. Seating is on tatami mats with a view of the delightful garden of Daiji-in (a sub-temple of the main Daitokuji complex) or, weather permitting, al fresco in the garden itself. 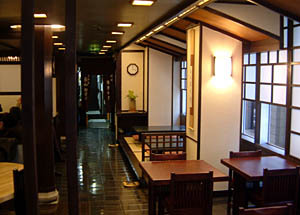 There are no prohibitions against alcoholic drinks, and bottled beer and sake are available along with an English menu.